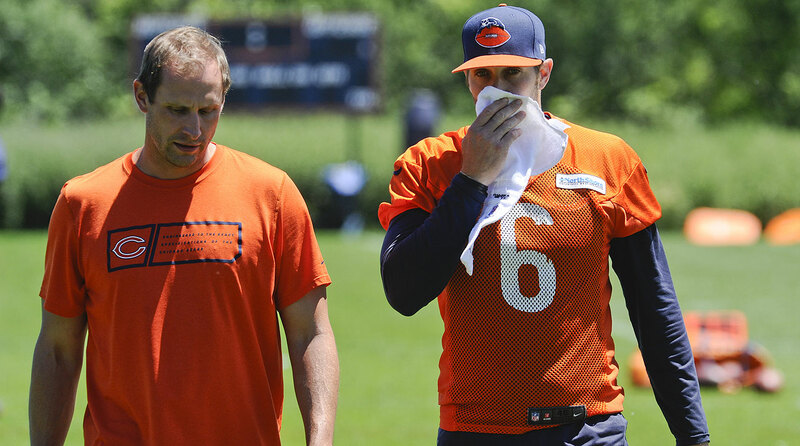 There’s a strong chance that this time next year, Bears quarterback Jay Cutler and new offensive coordinator Adam Gase will not be working together. A good season from Cutler will be parlayed into a head-coaching job for Gase. The 37-year-old followed John Fox here from Denver after going through a round of head-coaching interviews of his own this past offseason. A bad season from Cutler likely will leave Gase here at least another year, where he’ll help new GM Ryan Pace (also 37, from the Saints) search for another starting quarterback. If Gase and Cutler are both still in Chicago this time next year, it means the 2015 Bears will have finished around 9-7. If both are gone, it means a load of unforeseen crap got created somewhere along the lines and then quickly hit the fan. For Gase and Cutler to both prosper in this marriage, they must lean on the same man: Matt Forte. The offense needs to go through him. Some might argue it already has. Last season Forte posted his usual 1,000-plus yards on the ground (1,038, to be exact) and an additional 808 yards through the air. But many of his 102 receptions were check-downs. And his rushing attempts came too sporadically; in 11 different games he had 17 carries or fewer. The Bears don’t have to line up in old-fashioned I-formations and static two-receiver sets to run their offense through their 29-year-old tailback. Gase has a modern football mind, he understands the basic geometry that a staggering number of NFL coaches still don’t seem to get: spreading out in, say, three-receiver personnel helps not just your passing game but also your running game. When you spread out, the defense does too. So instead of there being a third linebacker to block with either your fullback or second tight end, there’s now a third corner who isn’t even in the box to begin with. Chances are, that defender is not making the tackle near the line of scrimmage. This is, in other words, the same end result as the best possible outcome of a fullback or tight end blocking a linebacker. What’s more, with a box defender removed by the spread, the running back has more space to work with. And you can still employ all of your traditional running concepts—especially with a smooth, patient back like Forte. One of Gase’s mentors early in his career was Mike Martz. The two were in Detroit together in ’06-’07 and San Francisco in ’08. Earlier in his career, Martz had been one of the trailblazers for three-receiver sets on first and second downs. He started this in St. Louis, where a three-receiver approach best capitalized on the unique multidimensionality of running back Marshall Faulk. Forte is not of Faulk’s Hall of Fame caliber, but he’s of Faulk’s ilk. Aside from improved but still inconsistent pass-blocking, Forte is a complete all-around player. This includes in the passing game, where he can run routes not just from the backfield, but also the slot or even out wide. Simply moving Forte around the formation is a way of making him your scheme’s catalyst. When you move a feared versatile running back around, the defense’s response often tips the coverage. It’s in this realm—presnap coverage diagnosis—where Gase must work closest with Cutler. The surly QB has often focused his efforts on the post-snap phase and been willing to let a play go late into the down. That works with a lot of Martz principles ... if you have an O-line that can keep a quarterback clean on regular deep dropbacks. Cutler played under Martz with a bad front five and got clobbered (52 sacks in 2010 alone). While Chicago’s line has since improved, it’s still a far cry from the one headlined by Hall of Fame left tackle Orlando Pace and veteran stalwart Adam Timmerman in St. Louis. Besides, Cutler is no Kurt Warner when it comes to post-snap decision-making. He’s no Peyton Manning, either, but that’s the style Gase needs to shift him towards. Gase must bring over the lessons he learned from working with Manning. Putting Cutler’s emphasis more on the presnap phase helps him get the ball out quicker. This is the best chance Gase has at curtailing the mechanical inconsistencies that many good coaches have tried but failed to wrench out of Cutler. Those coaches have learned hard lessons about what happens when Cutler has to continuously make full progression reads at the deep-intermediate levels. There will be some spectacular completions, yes. But erratic footwork and poor decision-making eventually will stall drives and, worse yet, lead to turnovers. Since Cutler, 32, still has not learned to lasso his considerable raw throwing talent, Gase’s scheme must regulate the QB—even if it seems counterintuitive to exploiting the advantages of wideouts Alshon Jeffery and first-round rookie Kevin White. Both have the run-after-catch prowess to be productive on quicker throws. And it’s not like there won’t still be opportunities to take a shot or two downfield. Gase just can’t premise his approach on such vertical concepts. With his targets—mainly Jeffery, but also tight end Martellus Bennett—having such wide catching radiuses, Cutler is prone to gaining a false sense of security and taking too many chances. Moving Forte around the formation also moves the wideouts around, increasing the likelihood of drawing a favorable matchup and, in the very least, creating the illusion of diversity to receivers’ route trees. This includes Bennett, who can use his size advantageously in the flats and last season was effective on shallow crossing routes. A quick-strike spread offense is also the best fit for the current Bears O-line. Overall, it’s an athletic group. But it’s also somewhat undersized, particularly when it comes to arm length. Putting blockers in position to “quick set” in pass protection, where they attack defenders, as opposed to having them drop back and react to defenders, plays to the group’s strengths and gives Cutler a larger pocket to throw. That helps mask the footwork deficiencies that he’s yet to fully rectify. It also expands the draw and play-action game, bringing the offense back to its most important player, Forte. 1. 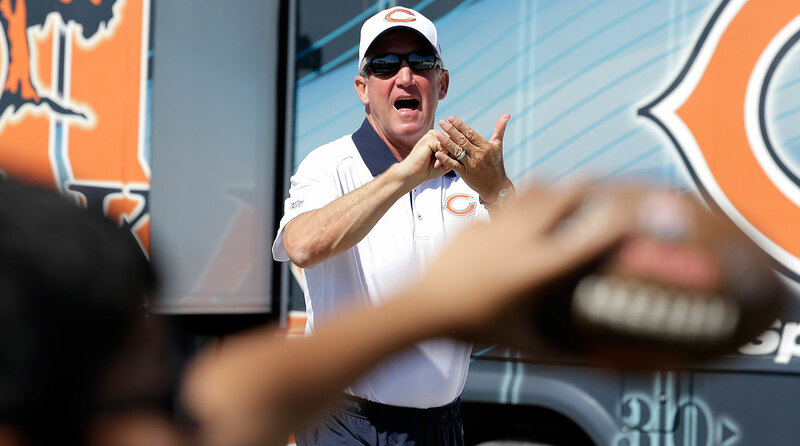 If on the day of his hiring you’d asked new defensive coordinator Vic Fangio, formerly the DC in San Francisco, how many players from the Bears’ long-standing 4-3 zone scheme he’d like to replace in his more diverse 3-4 system, he probably would have told you 10. And head coach John Fox, who will have a voice in the defense, probably would have agreed. Second-year corner Kyle Fuller is the only bright spot these men inherited. In free agency, the Bears acquired veteran safety Antrel Rolle and ex-Raven Pernell McPhee, so maybe Fangio’s answer now would be a more encouraging eight. The point: it’s going to be rough transitioning to his scheme this first year. 2. The roughest of the transition will be at inside linebacker. Jon Bostic and Mason Foster don’t have great physicality or instincts. Shea McClellin is inexperienced there and yet to find his NFL footing. But these are Fangio’s most realistic options at this point. Patrick Willis, NaVorro Bowman where art thou? 3. Fangio didn’t blitz much in San Fran. With Aldon Smith and Ahmad Brooks playing behind Justin Smith and Ray McDonald, he didn’t have to. He will in Chicago. With 33-year-old Jared Allen slowing down and moving to a foreign outside linebacker position, the roster’s only viable edge-rusher is Willie Young, who is coming off an Achilles’ injury. It will be fun to see what Fangio comes up with in his pressure packages. Prior to joining the Niners, he was on staff with two of the league’s more creative pressure designers: the Ravens, coordinated by Rex Ryan (’06-’08) and Texans (’02-‘05), coached by Dom Capers. 4. What happens with last year’s high-round defensive line draft picks Ego Ferguson and Will Sutton now that it’s a 3-4? The new front office and coaching staff have no skin invested in either guy. As rookies, Ferguson, who played the one-technique (shaded over the center), was a bigger and more impressive mover than Sutton, who often played the three-technique (between the guard and tackle). It would reasons that Ferguson’s style is the better fit for the new system. 5. Slot receiver Eddie Royal is a good addition, especially if Gase does indeed feature a quick-strike spread game. Royal thrived in this sort of system as a Charger. That said, $15 million over three years ($10 million guaranteed) seems a tad high for the 29-year-old. Maybe the Bears envision him contributing to their return game, as well?